My good friend Lawrence Bloom and I were having a catch-up call on Christmas Eve to exchange Season's Greetings. He said, "What do DK and friends have to say about 2013 and the shift that is happening?" I said, "As far as we are concerned the only thing one can do is to put one's faith in the Divine Spark to pave the way for all. It is very difficult to come up with appropriate super-computing models and scenarios in regard to what happens next. Fiscal Cliff negotiations in Washington DC are on-the-edge. There is a slow-down in the global economy in general and the European economy in particular. In some ways the last few years have been like the 1930s and perhaps we are coming to the end of that decade." Lawrence said, "Have you heard of the poem that the King recited during the Second World War because that was all about putting your hand into the hand of God?" I remembered the poem very well. 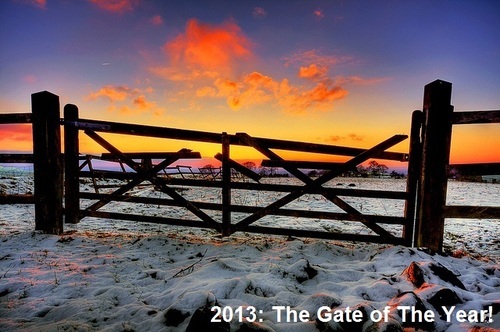 It is often referred to as, "The Gate of The Year!" although the author Minnie Louise Haskins titled it "God Knows" when it was originally published in 1908. The poem was widely acclaimed as inspirational, reaching its first mass global audience in the early days of the Second World War because of the radio broadcast made by King George VI. Its words remained a source of deep comfort to the Queen Mother for the remainder of her life, and she had its words engraved on brass plaques and fixed to the gates of the King George VI Memorial Chapel at Windsor Castle, where the King was interred. The Queen Mother was also buried there in 2002, and the words of "The Gate of the Year" were read out at her state funeral. It is fitting to remember this poem not just in preparation for 2013 but also in celebration of Her Majesty's Diamond Jubilee in 2012, which enjoyed extraordinary success with Divine Grace. It was a great pleasure to see Her Majesty during those celebrations especially at the one-thousand-vessels River Pageant in London which last took place three hundred and fifty years ago in 1662, during the reign of King Charles II. As we think of 2013 and "The Gate of The Year", perhaps we may benefit once again from the poem that Her Majesty handed over to her father 73 years ago, which he quoted from on December 25th, 1939. As King George VI said in the final line of that Christmas message: "May that Almighty hand guide and uphold us all."